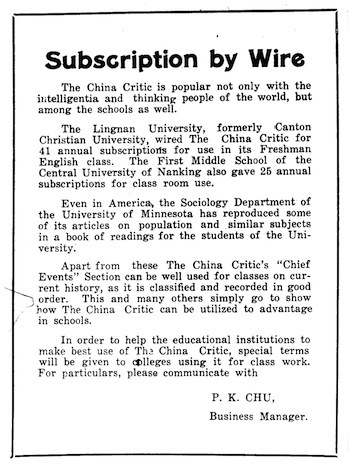 William Sima, whose research into the history and contents of The China Critic led to this combined issue of China Heritage Quarterly, has created a Chronology of the weekly. It follows the progress of The Critic from its first appearance in May 1928 through the highs and lows of the 'Nanjing Decade', and then through its various wartime permutations. The White Sun in the Blue Sky shall henceforth outshine the Red Sun in a white space that has been trying to appear on [the] Chinese horizon. General Chang Hsueh-liang [張學良] may be justly commended on taking this bold step in deference to popular wishes and in defiance of the imperialist dictates of our island neighbor. Any cynic who has believed in the impossibility of a united China has only his own face to slap. Chang Nai-yen 張乃燕, Chancellor of the National Central University (國立中央大學, still operating in Taiwan under this name; its mainland counterpart has been known as Nanjing University 南京大學 since 1949), contributes 'The National Central University—A General Statement'. Chang describes with statistical detail the adoption of a 'University District System' linking all primary and secondary schools, colleges and research institutes in Jiangsu province into an administrative system headed by the university. The dictator of our dictatorship is the spirit of our Tsungli [總理, Sun Yat-sen]. Its ministers, daily responsible to the dictator through the medium of prayer and so likewise inspired by him, shall be those who spear allegiance to his Revolutionary cause, pledge themselves to the execution of his Will, confess their own sins, give up their propriety, leave their families to live a pure and simple life for three years, and work together under one roof without any business secrecy from each other until dismissed by the dictator or voluntarily retiring from Government and policies on a word of honor. The issue of extraterritoriality (sometimes abbreviated 'extrality') has been a central political discourse of The China Critic since its inception, and is particularly evident this year. The editorial 'Extraterritoriality and Justice' in this issue celebrates the attempt by the Shanghai Municipal Government to prosecute three Mexican operators of clandestine gambling establishments, along with a number of their foreign and Chinese associates. In the special article 'The Development of Extraterritoriality in China', the first of six pieces by Edwin L.T. Fang 方樂天 on the subject, the author discusses the legal treatment of foreign nationals in China, beginning with the notorious 1785 execution of the British sailor on the Lady Hughes. Five more articles on extraterritorial were published in consecutive weeks. 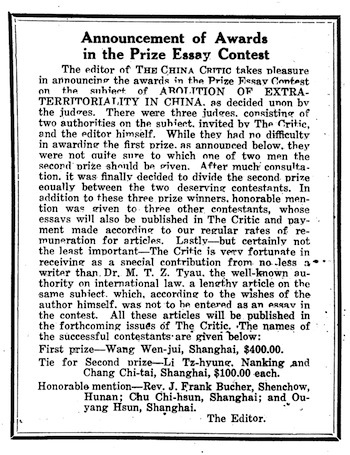 An 'Extraterritoriality Essay Contest' is also announced and cash prizes are offered for essays not exceeding 5000 words, to be awarded at the end of August. Neither the Government nor the Chinese nation resents criticism, but when criticism develops into mere scandal and slandal [slander], then the government has the right to put an end to it. A state is like an individual. Only a state with its diversified activities is more apt to err than an individual. No sane person would object to frank and useful criticism, but any person with a shred of self-respect left in him would most assuredly seek redress for any slander or libel against his good name. An individual may obtain such redress through the process of law, but a state is unfortunately handicapped in that respect as it has to be its own judge. 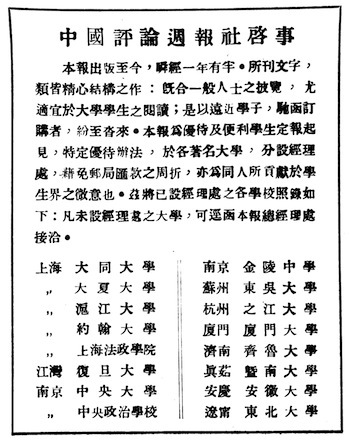 This editorial highlights the tension betweenThe China Critic Group's purported liberal position of support for free speech, their generalallegiance to a government that often compromised this belief, and between themselves, as an English-language publication, with elements of the foreign presence that they felt it their duty to confront. The so-called foreign 'die-hards' in China are decidedly behind the times. In spite of the rise of Chinese nationalism and the changing trend in international diplomacy, they still cling desperately to their ill-gotten privileges like a drowning person clinging to dear life itself. The most recent decision of foreign 'die-hardism' is the decision of the Municipal Council to guard the main entrances to the International Settlement by means of iron gates; one of which, indeed, has already been put up at the junction of North Szechuen Road and Range Road. If anyone still entertains the fond hope that foreign die-hardism has died out in Shanghai, he needs only to be a reader of The Shanghai Times in order to be unpleasantly disillusioned. In an editorial entitled 'Something Worse Than Stupidity', which appeared in The Times of August 25 and was intended as a rejoined to our editorial of August 15 entitled 'The Triumph of Stupidity', the editor of The Times endeavored to uphold the sanctity of the Settlement authorities and berated The China Critic for opposing the erection of iron gates at the Settlement boundaries. The Shanghai Times charges that The Critic 'descends to abuse and provocative language'. Yet in the same editorial it calls The China Critic 'mean' and 'mendacius' [sic]! Is that not provocative language? If to defend China's interests and attack foreign aggression is meanness, then by all means let The Critic be meaner! 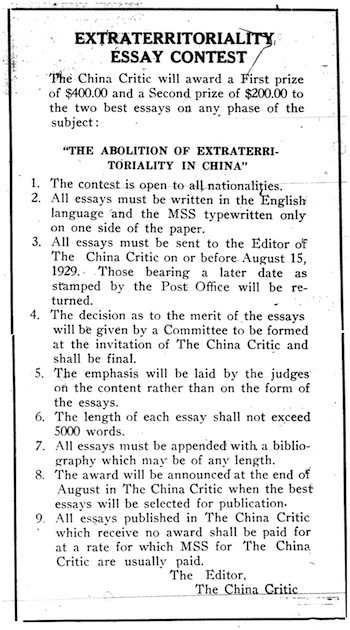 The first part of Wang Wen-jui's 王文瑞 'Abolition of Extraterritoriality in China', winner of the essay competition announced in June, is printed in this issue. The second part features in the 10 October issue of the journal. In his special article 'Early Chinese Colonization of Manchuria', Quentin Pan 潘光旦 begins a series of essays about the history of Chinese 'colonization' in the northeast, a process that he traces back to the early years of the Ming dynasty. 'We find that almost no sooner had the Mings unified the country', writes Pan, 'than a policy of extensive colonization was adopted'. Two further articles appear in the next fortnight: in 'The Qualitative Aspect of Chinese Colonization in Manchuria' Pan explores the 'biological and qualitative bearings' of Chinese migration to the indigenous populations of the northeast; and, 'Recent Chinese Colonization in Manchuria' is an account of Chinese migration further north, after 'the Manchu Government made repeated efforts to clear Kirin [Jilin 吉林] of all Chinese settlers after 1776'. These three essays epitomize Quentin Pan's penchant for race theory, something he employs here as a tool for historical analysis. And he presents a provocative view that in this age of foreign imperialism the history of Chinese settlement in Manchuria can rightly be considered to be one of deliberate 'colonization'. Jesperson's theory is that language originated in emotional songs, especially in songs of love, not songs in our usual sense, but songs which were half sung and half spoken (a way of rhythmic modulated expression pretty well expressed by the Chinese words: 吟咏). We have long forgotten entirely to associate the word for 'willing' (肯) with the idea of 'meat' and the word for 'able' (能) with the picture of an animal, and think of ridiculous it is to teach our children that England is classified under 'grass' (英), America under 'goat' (美), France under 'water' (法), Italy under 'heart' (意), Russia under 'man' (俄), and Germany under 'march' (德 ). Please direct all comments or suggestions to contact@chinaheritagequarterly.org. This page last updated: October 19 2015 17:55:34.